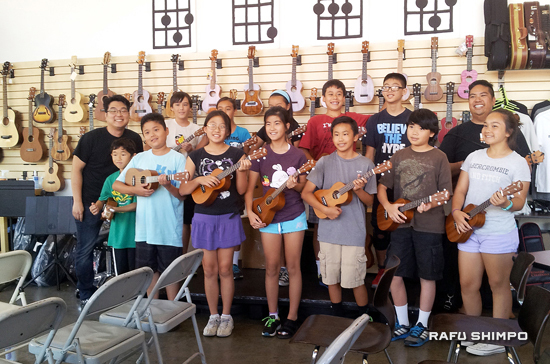 Campers take a ukulele lesson at the JACCC’s U-Space with Jason Arimoto and Brad Ranola. Camp Musubi turned 13 this year—a bona fide teenager. The Japanese American heritage camp’s one-week mission is to connect middle-schoolers to Little Tokyo and the larger Japanese American experience. As families continue moving away from J-Town and Sansei and Yonsei parents don’t have the same ties as our Nisei, making Little Tokyo relevant to the younger generations is more important than ever. Little Tokyo’s history is too rich to forget. This past July 14-18, we packed five days of camp with 22 presenters and guest speakers, ten workshops, four tours, camp games, one field trip and a whole lot of fun. With camp counselors Mei Yamamoto and Michelle Yamashiro, we planted a lot of seeds. We were gasa gasa, but good gasa gasa. Four themes emerged from the week and were reinforced at the culminating activity on Friday — a camper-led tour of Little Tokyo for parents and guests. Hal Keimi from the Little Tokyo Historical Society leads campers on a Little Tokyo tour. Camp Musubi is dedicated topassing on Little Tokyo’s 130-year history and connecting campers to our pioneering Issei and Nisei. It was a joy watching young people work with our community’s elders this week. • Priscilla Mui led us through a shibori-dyeing activity that took our T-shirts from humdrum to hi-tone. • Little Tokyo Historical Society member Hal Keimi led campers on a walking tour and Steve and Patty Nagano shared powerful video from the 1981 Commission on Wartime Relocation and Internment of Civilians hearings. • Little Tokyo Sustainability Committee member Amy Honjiyo shared the generations-old concept of mottainai and led campers to decorate recycling bins for the Japanese American Cultural and Community Center (JACCC), the site of this year’s camp. • Community artist Nobuko Miyamoto taught campers American Obon odori songs she’s created: “Mottainai,” “Fandango Obon,” “Yuiyo,” and “Ichigo Ichie.” She explained the meanings of the movements and the lyrics. • Camp Musubi met San Fernando Valley Japanese American Community Center (SFVJACC) members Nancy Oda, Paul Jonokuchi, and Phil Shigekuni. Campers were given a center tour, treated to a song by seniors in the ukulele class, and exposed to the dedication and work that goes into running a successful center. The need to document our lives was emphasized by filmmaker Tad Nakamura. He screened his latest film, “Jake Shimabukuro: Life on Four Strings” and talked how the photos we take today will become the archival photos of tomorrow. Tad encouraged campers to capture family gatherings, birthdays and their hobbies and interests. 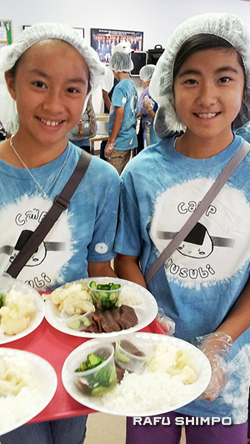 Campers help serve seniors lunch at the San Fernando Valley Japanese American Community Center. Learning to give back to the community is part of Camp Musubi’s curriculum. In past years, we’ve pulled weeds at Centenary United Methodist Church, created a Japanese American ABC coloring book for Nishi preschoolers, and played board games with Keiro senior residents. This year, students donned plastic gloves and hairnets to serve lunch to seniors at the SFVJACC. Camp Musubi, like so many of our community centers, sports leagues and cultural institutions, is volunteer-driven. Providing opportunities to serve the community helps ensure campers are prepared to lead and continue these organizations into the future. This year campers heard a variety of personal stories that emphasized the importance of finding one’s voice, following your passion and being an ally to others. Taiko pioneer PJ Hirabayashi from San Jose Taiko talked to campers about being insecure and quiet as a young person until finding her “voice” in drumming. Musicians Jason Arimoto and Brad Ranola from the U-Space at the JACCC shared their love for ukulele through an engaging ukulele lesson. Sometimes the best way to a student’s mind is through the belly. This year, Kotosh restaurant in Lomita led a sushi-making workshop. Chef Jorge “Koki” Matsumura and camp counselor Michelle Yamashiro have Peruvian and Japanese backgrounds and talked about being proud of their dual identities and how multiple backgrounds can lead to creative fusions of culture — like Kotosh’s California rolls with Peruvian green sauce. History is a labor of love for historian J.P. De Guzman, who did his doctoral research on the founding of the SFVJACC. This passion came through as he shared his findings with us in a rousing PowerPoint lesson. By teaching campers the unity clap, he emphasized how building community takes teamwork. Musician and record producer Glenn Suravech talked about his personal journey from Rafu Shimpo reporter, to guitarist for the Asian American indie rock group Visiting Violette, to a recording engineer and producer for Asian American artists. He returned the following day to conduct an impromptu musical jam session with campers and counselors, bringing guitars, drums, and a baritone trumpet. Check out the Camp Musubi Facebook page for video from the ensemble and a classical guitar solo from camper Brandon Wong. Several other excellent presenters rounded out the week. Keiro Senior HealthCare Community Resource Manager Brandon Leong and intern Ari Sadanaga led a lesson on healthy eating habits, but with a Japanese American twist. Our youngest presenter, 9-year-old Maiya Kuida-Osumi, taught campers how to fold origami paper poppers. Finally, the always supportive Clement Hanami from the Japanese American National Museum gave us a personal tour and activity where campers analyzed artifacts from World War II concentration camps, including a 1943 high school yearbook from Gila River. 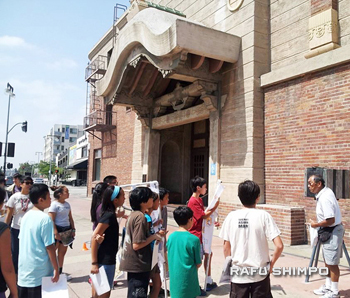 This year’s Camp Musubi culminating activity was a camper-led walking tour of Little Tokyo. Each camper was assigned a historic site. It was exciting watching this year’s 13 campers lead parents and guests down historic First Street, tracing the same steps as our pioneering Issei. Were great-grandparents listening as young people recounted how they boarded buses at First and Central for desert camps? Did generations of Nikkei nod as youth talked about family gatherings at the Far East Cafe? Were newer immigrants taken back as teenagers described the Hiroshima Eternal Peace Flame at Koyasan Buddhist Temple? Were graying Sansei surprised to hear teenagers recall the Little Tokyo Peoples Rights Organization (LTPRO) and late-night noodles at the Atomic Cafe? Did residents overhear campers talk about the teamwork it took to save the San Pedro Firm Building? Did parents’ hearts swell as their children stepped forward as the next caretakers of Little Tokyo history? Little Tokyo is so much more than just another downtown neighborhood. It’s our sidewalk history book, our family album. If forgotten, we risk losing role models, life lessons, cultural values and our collective memory. Preserving Little Tokyo’s history is essential to its future as a gathering spot for Japanese Americans. J-Town is an identity anchor for our children in a sea of modern distractions. Getting involved in the community can give them purpose and a 130-year sense of belonging. Take the effort to visit and get involved in Little Tokyo. Along with Camp Musubi, other Little Tokyo youth programs are Project Community, Bridging Community and Rising Stars. Along with honoring the past, it’s also important to build for the future. There’s fundraising to be done for the Little Tokyo Rec Center/Budokan, support for the JACCC, and we need to understand how the new Metro Regional Connector at First and Central could impact our Japanese American presence in Little Tokyo. Camp Musubi will be back again next summer. Once again, we’ll be tapping into the power of Little Tokyo, learning with elders, finding our voice, serving the people, having fun, and planting more seeds. Tony Osumi is Camp Musubi’s Camp Director. He lives in Culver City and teaches third grade at 68th Street Elementary in LAUSD. For more information on Camp Musubi, visit the official website.